Ready made Compost Bins are readily available in various sizes (such as 220 or 330 litres) and some Local Authorities offer them at discount prices (sometimes, less than a third of the recommended selling price) - it pays to enquire even if you don't see them advertised. The average household produces about 150kg of waste per year which could be composted; it is really quite amazing what can be composted, it is far more than just garden waste. See our separate page which gives details of what is referred to as 'green' and 'brown' compostible materials. To make the best use of a Compost Bin, they need to be located in the right place and filled with the right combination of material. 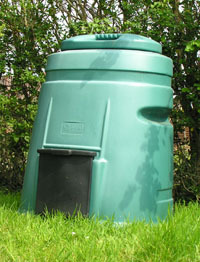 A Compost Bin should ideally be positioned on bare soil so that the worms can work their way up. However, if the bin must be positioned on a solid surface, (such as concrete or paving slabs), always put a layer of fresh, moist soil or some existing compost in the bottom. Almost any biodegradable material can be put in a Compost Bin but take care not to include any cooked food, meat or fish. The material should be a mixture, roughly 50/50 'greens' and 'browns' waste material - see our separate page explaining 'green' and 'brown' materials. In may help to have a 'kitchen' bucket to collect the various waste materials and then when it is full, take it down the garden and just tip it into the Compost Bin. A good mixture of biodegradable material will take 6 to 9 months to breakdown to a usable compost, during this period you don't need to do anything. Because of the time needed to produce the final compost, it may be worth having 2 separate Compost Bins - one which you are filling with new waste, the other giving you compost. The compost is ready to use once the material has turned into a dark, crumbly material giving off a fresh, earthy smell. Don't worry if there are still lumpy pieces with egg shell or twigs visible in the compost, this is perfectly normal. The compost will provide a mixture of nutrients and can be used to improve vegetable or flower gardens, to plant up pot and container plants or can be spread thinly to feed the lawn.